Ian Bertram's art is unmistakable: designed chaos, swirling with marks and tendrils to mirror the inner turmoil of the narrative's characters. Following his transformative work on E Is For Extinction and House of Penance, the artist is uniting with filmmaker Darcy Van Poelgeest for an intoxicating new miniseries: Little Bird. The plot revolves around a young Canadian girl inciting a rebellion against an oppressive American theocracy. Violent and immersive, the narrative veers from moments of psychedelic meditation to confrontational barbs on cultural imperialism. In the following Q&A, Van Poelgeest and Bertram walk through the inception and inspiration of Little Bird. 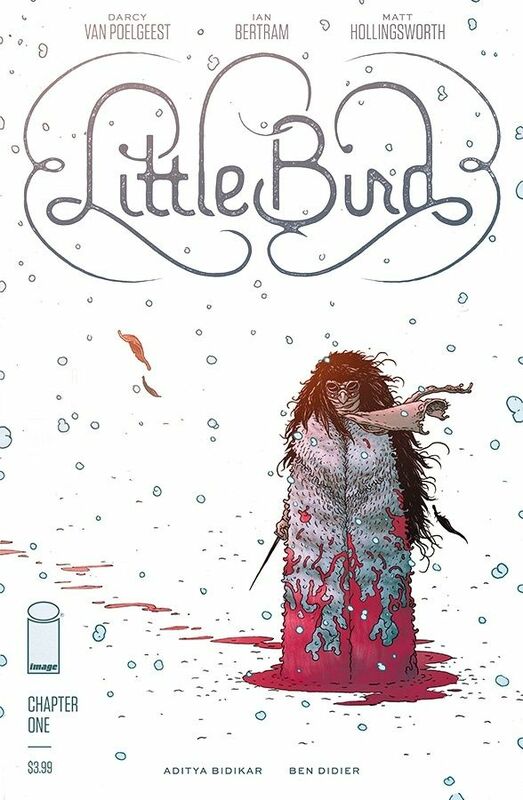 Little Bird #1 (JAN190099) is avilable at comic shops on March 13, 2019. Image Comics: How would you describe Little Bird? Darcy Van Poelgeest: Little Bird is the story about a young girl caught up in a war she can’t fully understand and the struggle to find her own identity within that. If she’s not fighting against an evil, theocratic empire that wants her land and soul—then who is she? It touches on some pretty heavy stuff, but it’s also a lot of fun. If you’re into science fiction, drama, and a touch of the weird, this book is for you! Ian Bertram: A true passion project. Image Comics: Darcy, your two short films are intimate/meditative noir and crime affairs—what attracted you to the prospect of a surreal science fiction war opera? Darcy Van Poelgeest: I don’t tend to think about genre much in the process. My interest is in people and relationships, and that transcends genre, or at least it should. For me, it just starts with an idea, and eventually that idea evolves into a time and place where it wants to be told, and I guess it’s around that time that the genre starts to form as well. There’s still those meditative moments between all the action, so it didn’t really feel like a departure from my previous film work. Those quieter moments are really fulfilling for me, and I think some of Ian’s best work on the book comes through during those more intimate moments as well. Mostly, Little Bird is just something that Ian and I really wanted to read, and we’re hoping there’s a bunch of people out there who feel the same. Image Comics: This also isn’t your first avian-themed project (Corvus). What keeps you coming back to birds? Darcy Van Poelgeest: It does keep coming up, and I can’t really think of what it is other than I love birds. My grandparents and my mom were/are bird watchers and dedicated environmentalists, so I’ve absorbed some of that. I love spending time out in the natural world in general, and I think a lot of what I write comes back to a preoccupation with the freedom we find in the wilderness. Image Comics: Little Bird references historical touchstones like the Inquisition and Manifest Destiny in its depiction of the villainous Bishop and The United Nations of America. What inspired the development of an imperial theocracy? How topical would you say this project is? Darcy Van Poelgeest: This is very much in our minds today. There’s a legacy of abuse, a long history of church and government working together to assimilate other cultures and people around the world into a Eurocentric culture and convert them into good little Christians, destroying families and cultural practices and identity in process. And it continues today where indigenous people are not being respected in terms of their rights and their connection to the land. I’m inspired by the survivors of cultural genocide and those who continue to resist that dark legacy. Ian Bertram: One of the things Darcy and I have spent many hours talking about is the trouble with dogma. It’s always a mistake. This comic centers around the use of fear to justify oppression, and the violence that arises in response. This comic is not a political diatribe; it’s an exploration of the problems with an us-vs-them narrative. Click here to read the rest of the interview at ImageComics.com!